As we go about our day to day lives we run into a variety of different scenarios. It's inevitable and all part and parcel of daily life, the good the bad, the happy and the sad. One cannot exist without the other. Of course a dominant factor in all our lives is how we get around from A-B, be it for social, business or pleasure. Since upgrading my car recently I have had to take a good hard look at my insurance policy, and since getting my beloved Mini on the road, I have felt like a sitting duck for people pulling out and just being drawn to my prized new car. We all have to get around and this is just as true for businesses. Vans are the very heart of most businesses and this is why having the right insurance policy will help keep your business on the road. That is exactly why Axa have created A Day in the Life of the Unluckiest Van. 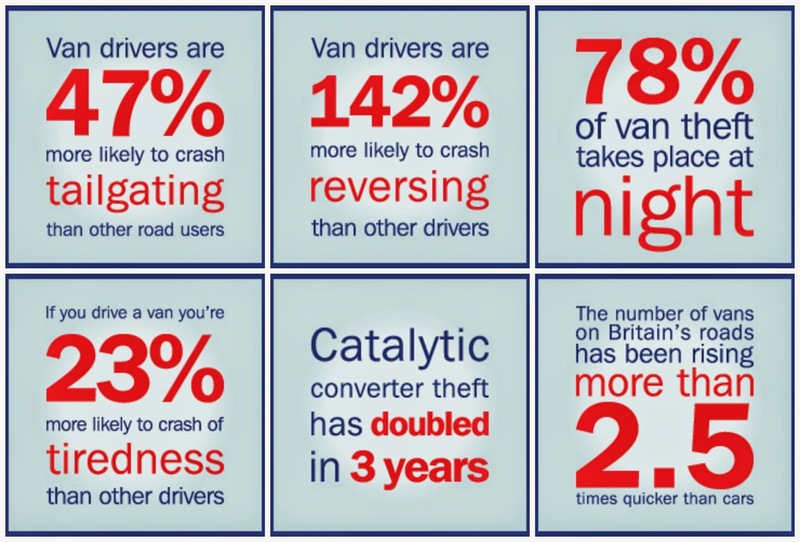 Road safety is extra specially important for vans, did you know that van drivers are 142% more likely to crash when reversing than any other motorist? Let's not forget that vans are bigger and weightier than your average car! I know that I personally would never have a calling when it comes to the van driving profession, but I can completely appreciate the extra skill needed to safely drive for a living. It comes as no surprise to me that vans are targeted in auto crime, they are of course a treasure trove of tools and other items that are used on the job. Did you know that 78% of bike crime happens at night? And did you know that Catalytic converter theft has doubled in the last 3 years alone? AXA Business Insurance has teamed up with Road Safety Analysis to present a study on British Van Drivers. You can read the full post here.